Twice abbot of St Albans (1420-1440, 1451-1465), John de Whethamstede called his four-volume compendium of history and classical literature the 'Granarium', a play on his name ('Wheathamstead') and on the 'kernels' of knowledge arranged alphabetically within it. Accused of neglecting his job because he spent so much time in pursuit of his studies and funds to beautify the monastery, he based his massive compendium on classical authors and the 14th-century Italian writer Boccacio. He was the first English author to write a history in a humanist style, although he shaped the mythological content to a moralising Christian purpose. Whethamstede organised his 'Granarium' alphabetically, as a kind of dictionary or encyclopedia. The first entry is on King Abagarus of Edessa, who appears in the apocrypha as the ailing letter-writer, who contacted Jesus to tell him that he believed in the messiah and asked him to heal him. After his resurrection, Jesus sent Judas Thaddeus to Edessa to heal his disease. 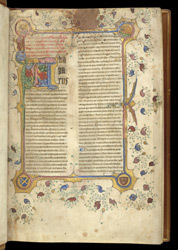 The page is decorated with a border having pictures of the Lamb of God and the eagle, symbol of the evangelist John, which holds a banner with the first words of his gospel, both images relating to the Incarnation and Christian belief in Jesus as the savour.